Amazing game, can't wait to see it moe fleshed out, although there seems to be a few optimization issues, the big one is the map, it runs fine on the training area map, but the first actual battle map is a bit laggy, probably due to the graphics/design, everything runs fine on the tutorial map. the only other "problem" is that the weapons customization system, especially the colors, is a bit awkward, it'd be nice to get stats when customizing weapons too. Other than that I can see this easily being one of if not the best mech games. Hi! I love this game! 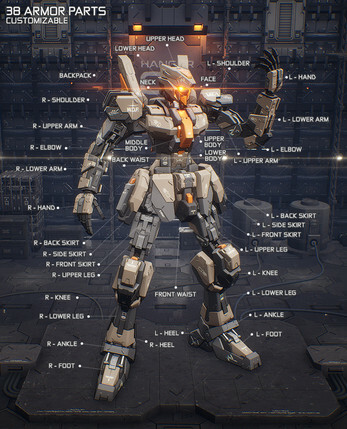 honestly i was hoping for game like this for many years i couldnt find earlier.. especially designs of mech, custom/build, smooth action and cute girls xD i cant wait to see multi play too. cant wait for full game! Off subject, taking a consensus, would you buy feet pictures? We'll add those tutorials into the game when it's on full release for sure! Also a help page and some quick instructions UI. Wow. Went hands on with this and was thoroughly impressed! Can't wait for the finished product! So much style. Thanks! Have you tried putting twin drills onto a pole yet? We're also making a three pronged and three-edge pole grips so you'll have drill tridents or something like that! Thank you very much! We hope you have fun playing around the customization! Hey, I'm having trouble getting the game to start. Whenever I start the game, the female character starts talking, and the game asks me if I want to start a new game again. If I say yes, the prologue plays again, and then the "name company" screen pops up on top of the female character's dialog. She keeps talking, but I can't read it, and I can't close the "name company" box. Sorry for the late answers, I'll keep this up on our critical bugs list and see if we can reproduce and fix it! No problem! Looking forward to playing it, because this looks like it's going to fill that Armored Core 4-shaped hole in my life. ABSOLUTLEY AWESOME GAME! I can't wait to see this get fleshed out , it plays very well and is a boatload of fun. 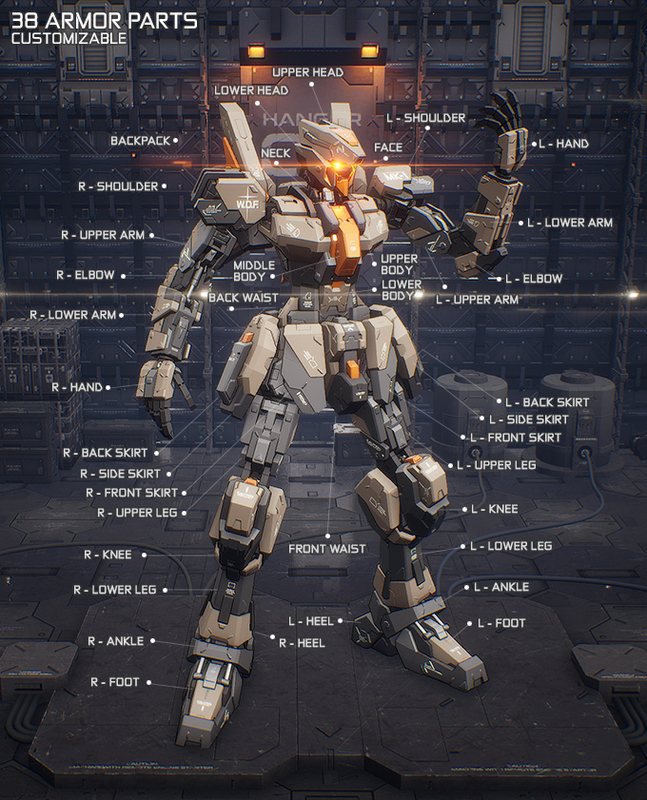 I would recommend adding more to the ui in the mass suit so that you get the feel of being in the suit. I also think that the targeting system needs a bit of work, I find it clunky at sometimes, but I know how troubling a targetting mechanic can be even for triple A titles. As mentioned by a previous comment the melee does need a little buff, the amount of time spent using melee weapons really doesn't feel like there is any real damage done. A running mechanic would be nice(there could be one that my dumbass just missed) because it feels like the only way to really move is with jets, and if you try to walk you are going to be ran down. Another mechanic that I think would be good to add to the movement is just a simple tweak to the jets. Make it to where if holding down space it will use thrusters to go straight up (it would make for cool rocket launches from height) and then if you want to have a directional jet jump have the player just use the normal shift+Space. Overall a terrific game that deserves more attention, I'm going to share it with my friends and hopefully get you a few more downloads, sadly I can't donate to the kickstarter, but if a find some spare cash thats the first place its going. Terrific job guys keep working hard! HOLY HELL. Just so much yes! I've already given my support after playing, but goddamn is this impressive! The customization is through the roof and the movement feels amazing! While the melee combat feels a little under-powered right now due to the enemy movement I'm still interested in trying it out more. Hope the video helps with the fundraising! Best of luck to you all and keep up the great work! Thank you very much! We've mentioned you as a great help in getting us in that final stretch of the funding! First of all, this a great looking game! The customization is amazing and really pushed to the maximum! I really liked it! Keep it up guys! Thank you very much! We never know of things like this from living in Thailand but we'll be sure to enroll for a chance!